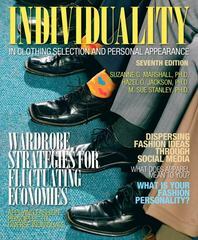 Individuality in Clothing Selection and Personal Appearance 7 Edition Individuality in Clothing Selection and Appearance, Seventh Edition, provides a strong, multidisciplinary foundation for individual and family clothing choices. Balancing theory with actual applications, the authors present a broad base of knowledge at an introductory level for students' general education. Packed with activities, learning objectives, illustrations, and photographs, this user-friendly book meets the needs of future fashion professionals as well as students taking a single fashion course.